"I don’t think we are heading towards any meadow, Bruce," Bonnie, the butterfly, said to her friend. "I think we’re near the sea now. You’re not very good at directions, are you?" "I thought we were heading inland. You’re right. I can smell the sea. I imagine we’ll see it in a few minutes. Keep your eyes open for seagulls. Remember our Campbeltown experience," Bruce reminded her. "I’ll not forget that one for a long time. There’s the sea now. What is that giant rock sticking out of the water?" she asked. "I’m not sure, but I think its Bass Rock." "Bass Rock? It looks too steep to have a river in it," Bonnie said. "Why do you think there is a river in it?" "It must be called Bass Rock because there is a river filled with bass, isn’t it?" Bonnie wondered. "Of course not. How could a river be on an island that small?" Bruce chided. "I wonder how big it is. It’s very high," she said, flapping her wings. "It looks to me to be about 450 feet or so," Bruce said. "Are you just guessing?" Bonnie laughed. "No. I heard about this island. It used to be a volcano. What I mean is it is leftover from being a volcanic plug," Bruce struggled to explain to a confused-looking Bonnie. "What is a volcanic plug, may I ask?" "It was the center of a volcano. The rest of the land was washed away by the sea and this hard rock is all that is left. It’s hardened molten rock. It’s rather impressive, isn’t it?" Bruce asked. "It looks like there is a lighthouse on it or some building," Bonnie said, flying around the island. "It’s a lighthouse. There have been lots of buildings on it. Once there was a chapel, but it’s all in ruin now. There were also other buildings and a prison. It would be horrible place for a prison, don’t you think?" Bonnie looked at the cold, windswept stone island. "I shudder to think of how cold it would have been. Speaking of cold, let’s land and rest. My wings are tired," Bonnie complained. 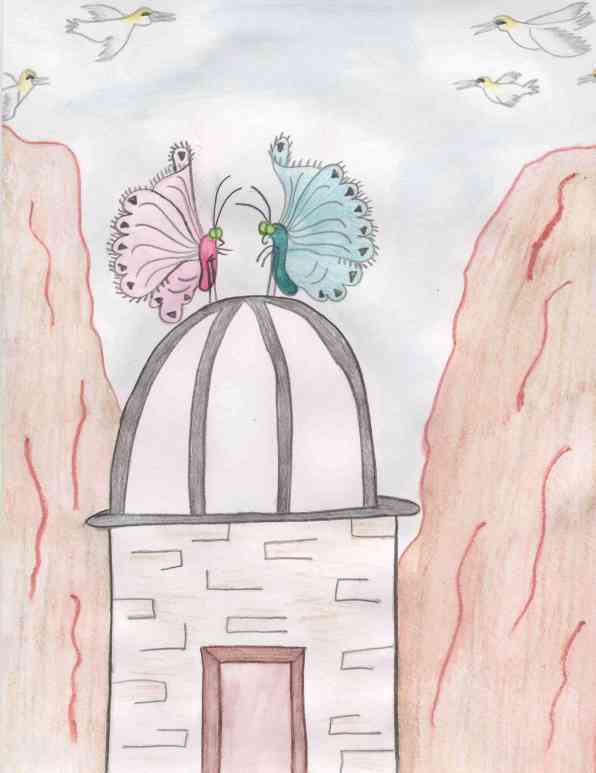 The two butterflies landed on top of the lighthouse. "What’s that noise?" Bruce asked. They listened carefully. "It sounds like…..like….birds….lots of birds," he muttered. "Birds? You mean we’ve landed on an island covered with birds. Bruce! You’ve gotten us into another mess now. I’m too tired to fly back to the mainland. We’ll have to hide and hope they don’t spot us. What kinds of birds are here? Seagulls?" "Worse? What could be worse than seagulls? Seagulls like to eat butterflies. There can’t be anything worse!" Bonnie stated. "Gannets! That’s what! And there are puffins, but we don’t have to worry about them. They only eat fish and spend most of their time at sea." "That’s comforting. So we only have to worry about thousands of gannets. Just great!" Bonnie whined. She looked around. "I don’t even see any flowers here." "I doubt if there are many. How could there be? The sea is rough and the wind blows and there are so many birds. Let’s go and see just how many birds there are," Bruce suggested. "Are you crazy? Why would we do that? They’ll spot us," Bonnie argued. "Come on. We’ll be careful," and with that Bruce flew off from the top of the lighthouse towards the top of Bass Rock. Bonnie had no choice but to follow. They landed on a rock that jutted out of the cliff, just inches below the top. "I’ll peek. You stay here," Bruce whispered. He flapped his wings just a little bit and went up to the top. Right in front of him was a nest. Inside the nest was a baby bird. When it saw Bruce, it squawked. "Shhhhhhhhh," Bruce told it. He flew onto the side of the nest. "Yikes!" "What do you mean, YIKES?" Bonnie called up to him. "Yikes! There are thousands and thousands of birds up here and all of them have nests filled with chicks. Come and see this." Hesitantly, Bonnie flew up to the nest. "Yikes!" she said. The two butterflies stared at the mass of white and gray feathers and beaks in front of them. The whole top of Bass Rock was covered with them. The noise was nearly deafening too. The sides of the Rock were covered with nests. There wasn’t one inch of rock that didn’t have a bird or a nest on it. "If they saw us, we’d be fed to one of these chicks," Bonnie said, looking at the scrawny baby bird in the nest. "I think now is a good time to leave Bass Rock." She flew down to the jutting rock. "Let’s go, please. I don’t want to be fed to a chick!" "All right. I think it might be wise if we do, but let’s leave via the lighthouse way, not this way," Bruce suggested. They flew down to the lighthouse. "This is going to be tiring. It’s a long way for a butterfly to fly across the Firth of Forth to the mainland." "This time, Bruce, find us a meadow. We know this is the sea and that’s not, so let’s just keep flying that direction until we hit a meadow. I’m tired, I’m hungry and ready for a rest," Bonnie noted. "I agree. Let’s be off," Bruce said and the two flew away from the lighthouse. "I’ve never seen so many birds," he said, trying to make conversation as they hovered above the rough sea. "There must have been a hundred thousand gannets. That’s a lot of birds!" "I can’t help thinking about the prisoners who were kept there, or the people who built the small chapel there long ago. I wonder if there were birds there then? It must have been pretty noise while they were trying to sleep," Bonnie smiled. "Bass Rock. I think I heard they used to keep sheep there too," Bruce said. "Well, I didn’t see any and I don’t know how there would be room. Ah, that meadow sounds really good right now, doesn’t it, Bruce?" Bonnie asked. "It does at that. It does at that," Bruce said. The two butterflies flew silently onwards, leaving the squawking gannets behind them on Bass Rock.